_Put those old cameras to the test! The below are from my collection of antique and toy cameras. _Voigtlander could possibly be the oldest name in the cameras. An optic company at it’s early beginnings in 1756, Voigtlander later went on to create many firsts in the photographic industry including the first metal daguerrotype camera, the first zoom lens and the first electronic flash built into a 35mm camera. This early 1950‘s single lens reflex camera is in excellent working condition and a good example of the Voigtlander standard of superb craftsmanship. _The Diana mini is a basic box camera constructed entirely of plastic. 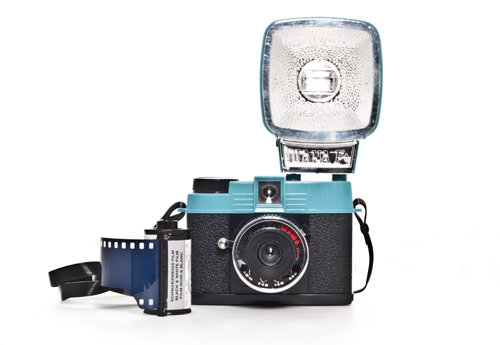 It features a spring loaded shutter, hand crank for film advance, and a view finder. The Diana line of cameras first hit the market in the 1960’s in many different versions of the same basic plastic box camera. Coveted by enthusiasts who prefer the imperfect vignettes and soft focus of the obsure, the Diana has made a come back in a big way in the last decade. 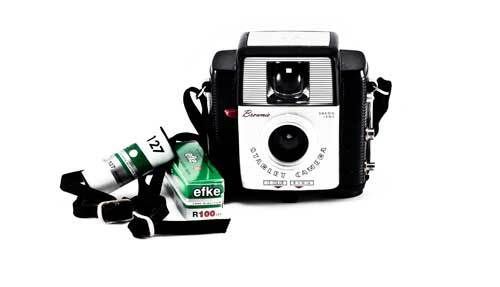 This version of the camera is in miniature and able to shoot 72 frames on a roll of 36 exp 35mm film. _Blackbird, Fly is a new version of a classic camera style. 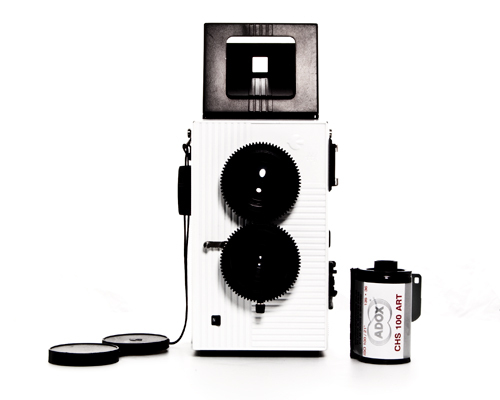 This all plastic Twin Lens Reflex camera has three formats for shooting 35mm film. A unique feature of this ‘from the hip’ shooter is that in the large square format you can expose the entire piece of film, sprocket holes and all! This is the second of these cameras I have owned. Blackbird, Fly does have one glaring draw back in it that the film advance is a rather weak piece of construction. If you get too excited in your winding you may just wind the crank right off the camera!! _Created in 1956, the Brownie Starlet is a part of the Kodak ‘star’ series of cameras. I found this one in an antique shop under a thin layer of dust. With a little cleaning and a new roll of 127 film, I can see why is was such a fun point and shoot for photo enthusiasts of all ages.